The worst part? No one comes to her aid. 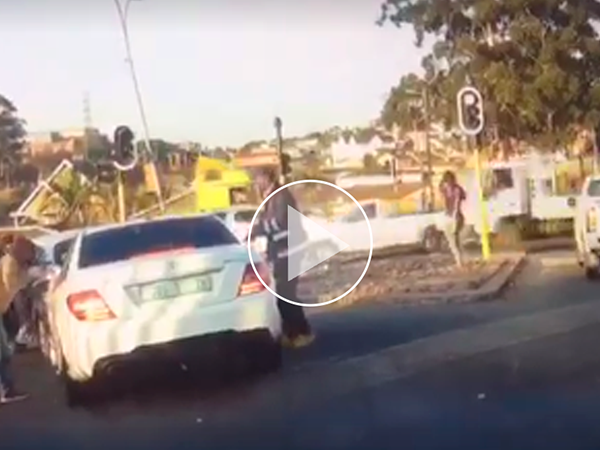 A disturbing video of a woman being hijacked in Chatsworth, Durban has surfaced on social media. The video taken by another driver's dashcam shows the terrifying ordeal. In the video, two cars are driving towards an intersection when the car in front of the Mercedes suddenly stops. Four men, seemingly carrying weapons, jump out of the car bang on the white Mercedes' windows for the driver to open the doors. Eventually, the driver of the Mercedes opens her car door. At this point, the owner of the car recording the video sees the apparent danger, and switches lanes. The owner of the Mercedes then comes back into frame, clearly in shock. She bangs on the door of a Hilux bakkie frantically. The driver gets out of his bakkie, looks back in the direction of the hijackers and gets back into his car. The hijacking victim runs off frame again and is not seen again. The identity of the woman is still yet unknown. Chatsworth police confirmed to YOU a case of hijacking that took place on 13 June at 4.10 pm was being investigated. "The complainant alleged she was seated inside her stationary vehicle at a set of robots when she was accosted by an unknown number of unidentified suspects," Colonel Thembeka Mbhele said. "At gunpoint the suspects robbed her of her vehicle and drove off. The vehicle was later recovered by SAPS members. A case of carjacking was opened at Chatsworth police station for investigation."